There are many other words often associated with fly fishing for Permit but they will be excluded to keep profanities off the site. To quote a professional fly fisherman in the Miami area who’s name and expletives are intentionally left out “after all these years, I’m done with that fish”. He literally quit fishing for Permit after over 7 years of frustration but he really didn’t. He caught his first Permit on a fly in July 2012. Very little is known about the breeding habits and general behavior of the Permit but we know enough to fish for them. We do recognize that the behavior of the Permit changes significantly between the deep water Permit swimming around wrecks and reefs and the Permits of the flats. They have also displayed aggressive behavior when in large schools but this is rare. The adults come into the flats from the deep channels to feed in the warm shallow water of the flats preferring eel grass, sand or mud flats mostly. They are not affected by heat, in fact they are completely unaffected by temperature and hunt the flats during the heat of the day when bones and other flats fish take refuge in cooler channels. We also do know that adults feed on crabs, shrimp, and smaller fish which is what they are eating on the flats. It is also what gives us our chance to attain the holy grail of fly fishing. What makes them so elusive? The eyes have it! Permit have massive eyes and incredible vision. These golf ball sized eyes can rotate almost 360 degrees and give an unfair advantage to the fish. Some think that they are farsighted and can only see well at a distance. This is why some guides recommend throwing a fly right on the nose of a Permit. They are relatively flat and can also turn sideways and swim in less than 12 inches of water, if we hadn’t seen it, we would have never believed it either. These skills alone make the Permit the Houdini of the flats. They become extra spooky in the flats when feeding but are sometimes known to float in the water to rest. They’re resting and watching the for any movement of potential food. The current brings the sea grass sargassum and the sea life within it to the floating permit and they float in wait of the buffet that comes to them. While hunting or resting they keep eyes to the heavens looking for birds and the occasional fly fisher who thought they was actually sneaking up on the fish. Another variable that adds to the difficulty is they like to examine their food before they strike which is contrary to bonefish behavior. Permits will swim to a fly and look at it; it’s not uncommon for an angler to twitch the fly thinking it’s being eaten. This usually spooks the fish. Permit fish can reach a fork length of 48 in. (122 cm) and can weigh up to 79 lbs. (36 kg), according to the Florida Museum of Natural History. They range from 10-30 lbs. on the flats, but the Permit hunting the flats are the usually bigger fish in the 30-40 lb. range. World record Permit on a fly was held by Brian Eliason who caught a 51 lb. Permit in Key West, Florida using 16 lb. tippet in 2003 but later disqualified. Fishing for Permit on the fly is tough and not for the casual fisher, you won’t succeed without good eyes, perfect casting, the right flies and a lot of luck. Flyfishbonehead has seen them spook from 50 feet before a cast was attempted. They saw the fisherman lift his rod to cast and scattered. What you need is a clear day, any temperature from warm to hot, water and some fish. A Biscayne Bay guide once said, “When the sky looks like the water the Permit will come.” This has been almost universally correct in Biscayne Bay & the upper keys, but some guides in Belize prefer a slight chop on the water to keep the playing field more balanced. Other guides like the choppy, windy days believing that the less than perfect conditions favor the angler because the fish can’t see as well through chop and cloud cover. Cloud cover is a major disadvantage for the angler as well, you can’t catch fish you can’t see. The Tail of the Permit is very distinct and usually the Achilles heel of the fish. From a distance the tail and dorsal fins of the Permit are black so you wouldn’t expect to see it, but they’re super reflective, almost mirror like. It’s as if someone is signaling you with a mirror from a distance. It otherwise looks like a mangrove sticking out of the water or floating debris. Once you see one reflecting in the distance, you’ll never forget it. They sometimes find a place in the late mornings to float and hunt. If you happen to see them before they see you, you have a chance. It’s best to keep your distance and position yourself for a long toss right on the nose, which most times will be a few feet away from the fish in perfect location. This is where casting must be flawless! This is the one fly fishing scenario where you truly get only one shot. Once in a blue moon you might get the option to pick up and throw again if the fish don’t spook on the initial cast. Permit will strike while your fly is sinking but only if it sees it, so it’s best to cast close to the fish. Most of the Flyfishbonehead staff would rather hit the fish in the head than throw too far away and never have the fish actually see the fly. Sometimes when the Permit are in small schools and feeding, a weighted shrimp pattern stripped through may get their attention and generate a hook up. Contrary to commonly propagated myth, a permit will chase & eat a fly this is stripped. The reason many anglers say they wont eat a stripped fly is because the crab patterns used spin. If your fly spins, the permit won’t eat, it’s really that simple. Permit won’t eat a live crab if it spins so why would they eat a fly that spins? Another common misconception is Permit don’t mud. They do mud, it’s just not as much or as often as bonefish. The Permit seem to be on the flats in the Florida Keys in the early spring, moving out to the deeper water in late spring briefly to breed then returning until the first cold front. 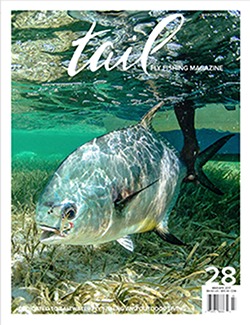 Central America boasts one of the best Permit fisheries of the Caribbean Sea which is also alive with action all year long but best in from March through June/July. The fishing doesn’t really change much in the various locations. There are no major migrations or hatches that anglers anticipate. The fishing is really just a matter of picking your location, getting some good weather, timing and much luck.